Ships and Energy Exploration Threaten Rare Gulf Whales – Neptune 911! (Reuters) – The only resident group of whales in the Gulf of Mexico, a population numbering fewer than 50 animals off the Florida panhandle, has moved one step closer to possible federal protection under the U.S. Endangered Species Act. The National Marine Fisheries Service said on Monday there is sufficient scientific evidence to consider granting protected status to the Byrde’s (pronounced BROO-dus) whales, which environmentalists say are threatened by ship traffic and energy exploration in the Gulf. The Marine Fisheries Service, an agency of the National Oceanic and Atmospheric Administration, made its finding in response to a petition filed in September by the Natural Resources Defense Council (NRDC). The agency is now required to conduct an additional in-depth review of the whales’ status to decide whether safeguards are actually warranted under the Endangered Species Act. If so, the agency would undertake further study before it could propose formally listing the whales as threatened or endangered. In its petition, the NRDC cited several threats to the diminishing population of whales in the Gulf, including collisions with ship traffic, pollution from offshore oil development, and acoustic stress from both sources. The Marine Fisheries Service agreed the petition presented substantial scientific evidence that vessel strikes and undersea noise posed a dire threat to the Gulf whale population, given its very limited size. The agency said it would review those issues and other factors during its forthcoming analysis. 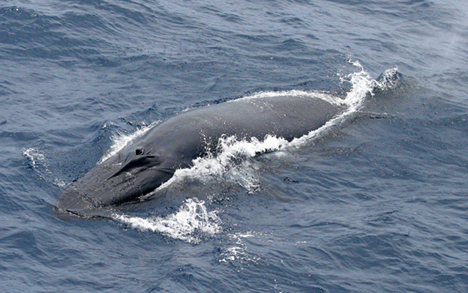 The Byrde’s whale fills a unique ecological niche as the Gulf’s only resident baleen whale. It is also genetically isolated from the rest of the species, which is found in temperate and tropical waters of the Atlantic, Pacific and Indian oceans. The best estimates put the whale’s Gulf population at just 33, the Marine Fisheries Service said, citing a 2009 oceanic survey. The NRDC said fewer than 50 ply the waters of the eastern Gulf.